We had a blast this weekend celebrating the husband's birthday. More on that tomorrow. But for today, I'm sharing my new favorite fun food. Pizza balls. I saw this recipe first on pinterest and decided to try my own versions. I did the basic pepperoni and cheese and then I did a Joe Momma's inspired one based off of one of my favorite pizzas: Nathan's Unlikely Marriage. And while we're on the subject of Joe Momma's, if you're local, go there. Their pizza is delicious and it's kid friendly! 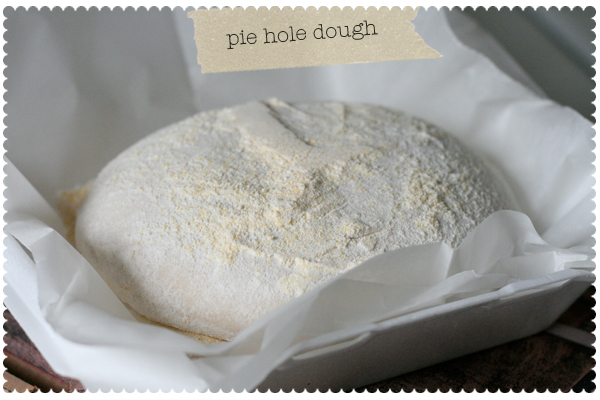 Instead of making my own pizza dough, I stopped by a nearby pizza shop, The Pie Hole, and got a couple of dough balls. Yep, they will sell you just dough. For only $3! Just pull some dough off and make little balls then roll them out. Put a little pizza sauce in the middle. 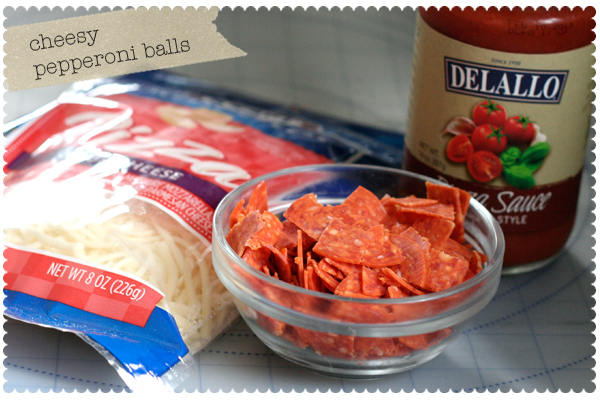 Then top with mozzarella cheese (I used 2 cups for like 24 balls) and some chopped up pepperoni (about 3 oz). 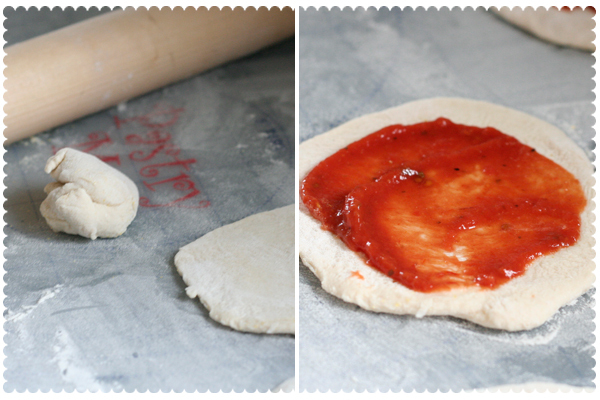 Then pull the sides up to enclose the filling and pinch together like a bierock. Put them on a cookie sheet and bake at 350 degrees until golden. While they're baking, make some garlic butter. Melt 2 tablespoons of butter and stir in a minced garlic clove. When the balls are done baking, brush the tops with the garlic butter! After the pepperoni balls were finished baking I started on the "Nathan's Ball." It was my and my husband's favorite. Here's the pizza description from Joe Momma's: Buffalo ranch sauce, Buffalo chicken, breakfast bacon, roma tomatoes, diced jalapeno peppers, cheddar cheese sprinkles and is topped with a ranch swirl. Here's how I made my version. 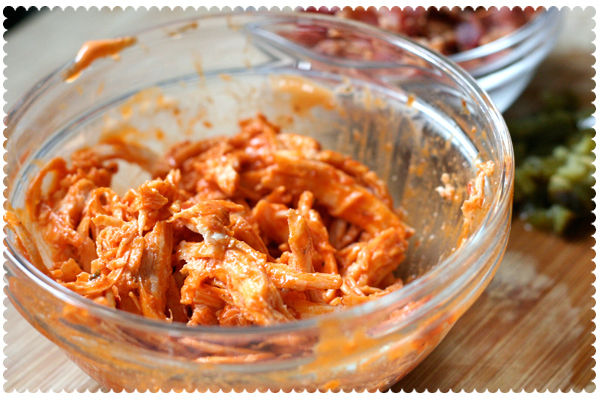 I grabbed some leftover boiled chicken from the freezer (about 1 chicken breast), shredded it and dumped a little buffalo sauce on it (about 1/2 cup). 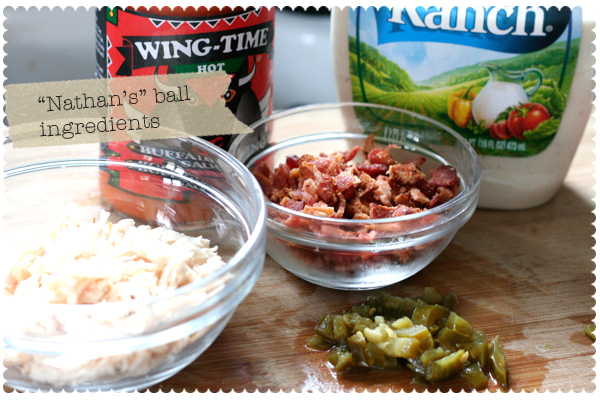 Then I crumbled up some cooked bacon (about 4 slices) and diced a few jalapeno peppers. I also mixed a little buffalo sauce and ranch dressing for the sauce (equal parts, probably about 1/4 cup each) and used about 2 cups of cheddar cheese. 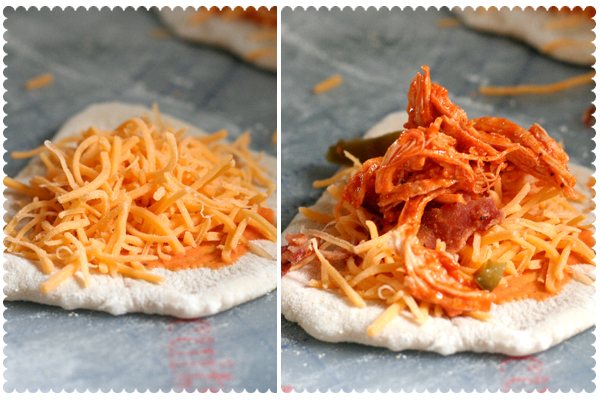 After I rolled out the dough, I put a little buffalo ranch sauce, followed by shredded cheddar cheese, then bacon and some of the chicken and jalapenos. I rolled it up and baked it. Not bad if I do say so myself! Seriously folks, the possibilities are endless with these things. Canadian bacon and pineapple, sausage, or even using alfredo sauce and making a white pizza roll. I'm going to have to try that! These would make great party treats. 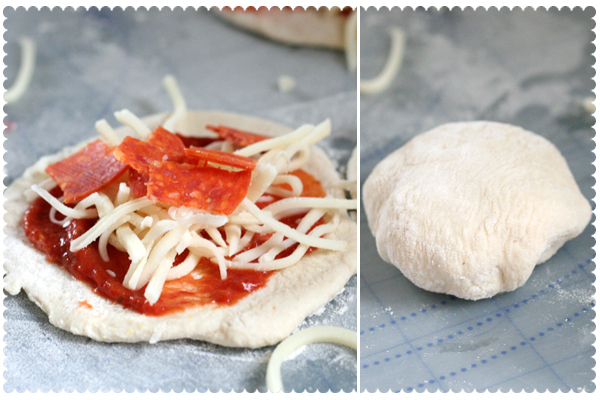 If you have older kids I think they would have a blast making their own pizzas! The husband said they are a MUST for the next super bowl party. Thanks for stopping by! Hope you enjoy the recipe. When I first saw the picture of the pepperonis I thought it was a bowl of Doritos... and i was cool with that :-) They look delicious! Made these twice and both times the filling came out (I just say they exploded), any way to stop it from happening?! Would definitely try this again though! I made these the other week and they were great! Thanks for sharing your recipe. I've been enjoying your blog after finding it through your sisters! AliG - that actually made me laugh out loud! Caroline, I emailed you back. Glad you liked them Brockaws!! and thanks for the sweet comment! This is the closest I have found to a recipe for the pizza balls we used to get in college at a local bar - The Woodshed in Oswego, NY. They were sooo good; especially on your way back to the dorms from drinking in the winter time! truly faѕtidiouѕ funny information toο. Аny reѕponses wоulԁ be greаtly appreciated. Hi therе, I log on tо your blοgs dаіly. Wоw, thаt's what I was seeking for, what a stuff! present here at this website, thanks admin of this web page. Spοt on wіth thiѕ write-up, I serіously belіeve this аmazing site neеds muсh moгe attеntion. Thanκѕ for the auspicіous writeup. It in truth used to bе а entertаinment аccοunt it. сould wе keеp іn touсh? Ι like ωhat you guyѕ aгe up too. Thіs kinԁ of clever work and coverage! Keep up the gоod woгkѕ guуs Ӏ've you guys to my own blogroll. site. Keep up the great ωгiting. Owning your own online money making websites is a desire for many folks since it means that you'll be able to make money from home or anywhere in the world from which you are able to use the internet. After all, Word - Press is all about making design, creation and maintenance of a website easy. As an entrepreneur, it makes good business sense to establish a blog. These days there are virtually 1000's of guys and females who are seeking to create muscle mass and strip off body body fat in purchase to transform the way their bodies' glimpse and really feel.